Durango Urgent Care provides immediate attention in the treatment of any non-life threatening illness or injury. Patients are seen on a walk-in basis. We are a walk-in urgent care clinic. We are open EVERY DAY from 9:00 am to 7:00 pm including weekends. 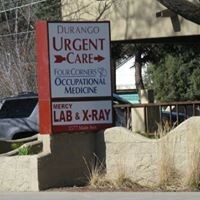 We are the only in-town urgent care clinic and are located at 2577 Main Avenue (across from the Fairgrounds). We also offer drug and alcohol testing and work site injury treatment.